LAKEMBA gets an undeserved bad rap in Sydney. This predominately Islamic neighbourhood in Sydney’s south-west does have its share of youth problems and there can be the odd (yet very rare) act of physical tomfoolery (almost always involving unscrupulous youths against other unscrupulous youths), but generally, it’s a quiet, welcoming and respectable community (a best mate’s father lives there). 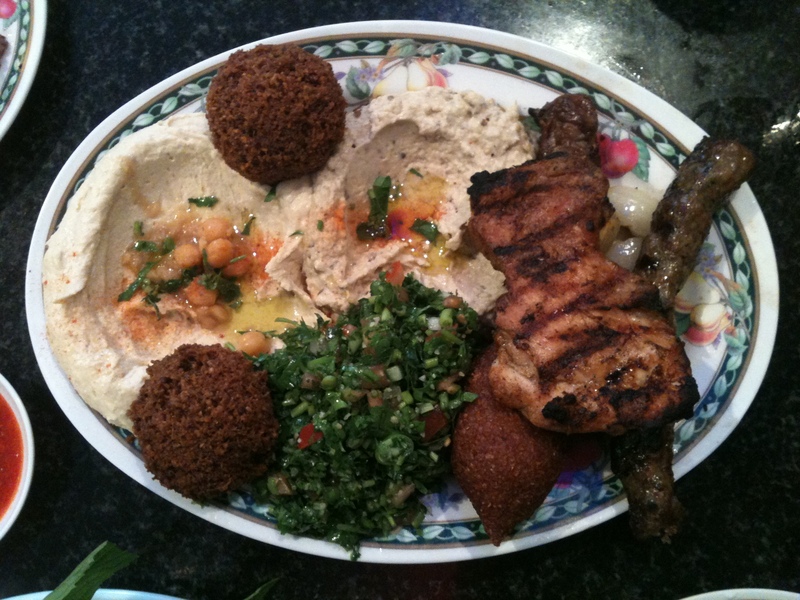 It is also home to some of the best Middle Eastern food that you can find east of Aleppo (or Damascus and Beirut). Walking along the main street (Haldon Street) you will come across Middle Eastern grocers and butchers, sweet shops and hole-in-the-wall manosha (Arabic pizza) and kebab places. Not only is Lakemba Sydney’s epicentre for Middle Eastern food but as it is an Islamic neighbourhood there are Indonesian, Sumatran, Bangladeshi and even Christmas & Coccos Islands restaurants – all serving Halal food (and some home comforts) to hungry residents. It is also the home of Jasmins where you can feed two for about $20 and still have food left at the table. I was recommended Jasmins by that aforementioned best friend of mine whose family hail from Aleppo in northern Syria. 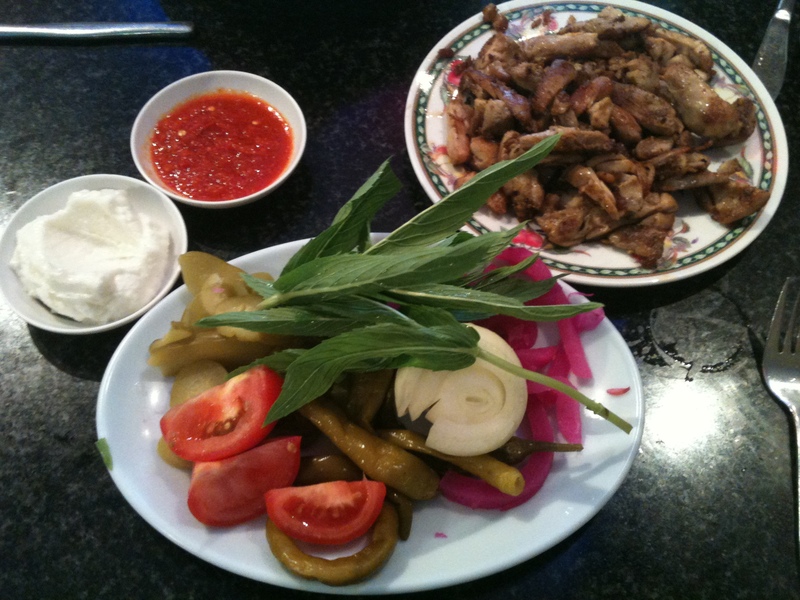 Aleppo is known as the gastronomic capital of the Middle East – if you think of any type of Middle Eastern dish it more than likely hailed from Aleppo or was finessed in Aleppo. Why? Because it was at the end of the Silk Road and Aleppo had the best of both worlds – it was exposed to traders arriving and bringing their wares and it was able to influence those same traders who took the culinary delights they discovered in Aleppo back to places like Turkey and China. So, if a Syrian from Aleppo recommends a restaurant then it should be good. You could forgive yourself thinking that you were entering a Hamum than a restaurant. The walls at Jasmins are lined with polished sheets of granite with masterfully and colorfully painted reliefs depicting scenes of citadels and ports. The ceiling features gilt-coloured inlaid domes with down lights. The tables are of black heavy marble-like stone set with aluminium cafe-style chairs. Jasmins gets packed. There is a steady line of locals but tables turn over at regular and quick intervals – it’s a place to eat, not linger. There also is a dominant take-away crowd who jostle in between the tables to get their orders in and jostle back laden with their feed in only minutes. Take note: no alcohol is allowed on the premises (soft drinks and juices are available from the fridge). The menu offers individual dishes or combination platters (a bit of most favourites). The menu has the Middle Eastern staples: foule (broad beans); fatah (chick peas, pine nuts and yoghurt); homous; tabouli; kuftah; shish kebab; sausages (filled with minced lamb and pine nuts); grilled chicken, kebeh and falafel (among a few). Prices are surprising low – $6 for vegetarian, $9 for meat and the platters range from $10 to $13. Once you order out comes a basket full of unleavened bread and a plate of mezes consisting of pickled cucumber slices and chili, olives, tomatoes, torshi lift (pink-coloured pickled turnip), onion, fresh mint and dished of harissa and one of the best toum I have tasted. Toum is that wonderful light emulsion of minced garlic and olive oil (it’s like aioli). At Jasmins it is creamy, fluffy and airy like a mousse. This one is not too overpowering or overbearing and is used sparingly to liven up char-grilled meats. Divine. You don’t have to wait too long for the food to arrive at Jasmins and it is food to share. The first plate was full of char-grilled slices of chicken ($9). It’s good – juicy and tender with a nice charcoal char flavour through it. Grab a triangle of unleavened bread, smear some harrisa and toum on it, heap on some chicken and add some pickles and mint, wrap and eat. It doesn’t get that simple or better (and it is an ideal dish for kids). Almost immediately the mixed plate ($13) arrived. The plate is ideal if you want to sample the menu. It consisted of two falafel, a kibbeh, a piece of char-grilled chicken, a kuftah, some pieces of shish kebab, puddles of homous and baba ghanoush and tabouli. 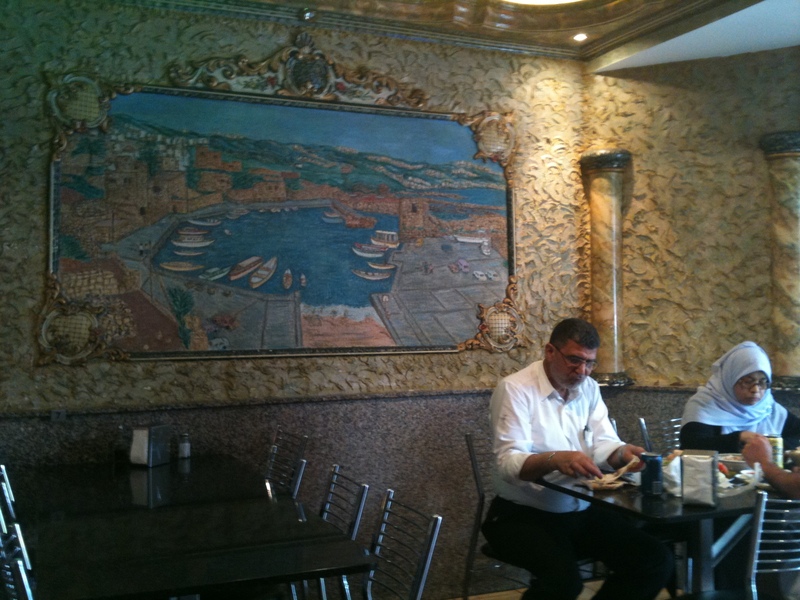 I have to start with the falafel – they would have to be the best I have tasted anywhere. Firm, crisp and crunchy on the outside yet light and moist inside. They are seriously, seriously good. The lamb shish kebab is tender and again has that wonderful char flavour to it (as does the piece of char-grilled chicken). The long rolled piece of spiced lamb kuftah is magical – grilled finger of minced lamb blended with sweet spices. Kebbeh is possibly the most famous of dishes in Syria (and yes, it originated in Aleppo). This egg-shaped morsel has a shell made out of ground bulghur and filled with minced lamb which has an array of sweet spices added to it (like allspice, cumin and cinnamon). It is then lightly fried so you have a firm and crisp shell embracing the meat filling. Jasmin makes it well. I’m not let down by the dips and the tabouli – these are dishes that must be done well or they will destroy the meal (and a restaurant), as, like with the chicken, you can combine these with your meats in the bread. The two dips are excellent – they are smooth and packed full of flavour. The tabouli has a mountain of parsley and unlike variations that you get elsewhere (greasy kebab shops or supermarkets) it is dressed properly – not too much lemon juice or oil – the freshly chopped ingredients are the heroes here and don’t need to be disguised. With a tummy on the brink of bursting it was hard not to stop eating with so much good food around and, alas, a couple of pieces of grilled chicken (albeit small), were left on the plate. I paid the bill and picked up some takeaway tabouli (I can’t make it for the price and could never replicate its greatness) for something light for dinner but also to keep alive the memory of Jasmins. The verdict: The food is fresh, fast, cheap and plentiful. Welcoming (yet the place can get a bit fast and furious). Wonderful Arab hospitality and they would be insulted if you left without a full belly. By far the best falafel outside of Aleppo (no kidding). What: Jasmins, 30B Haldon Street, Lakemba NSW 2195. Phone (02) 9740-3589. Ate there: 23 October 2010. Tip: If you want dessert it is only a short drive to El Rabieh at 769A Punchbowl Road at Punchbowl where you can divulge in Middle Eastern sweet pastries (and buy kilograms of it if you like), or lick on an array of refreshing ice creams from $3.50 (all flavoured with a hint of rosewater). 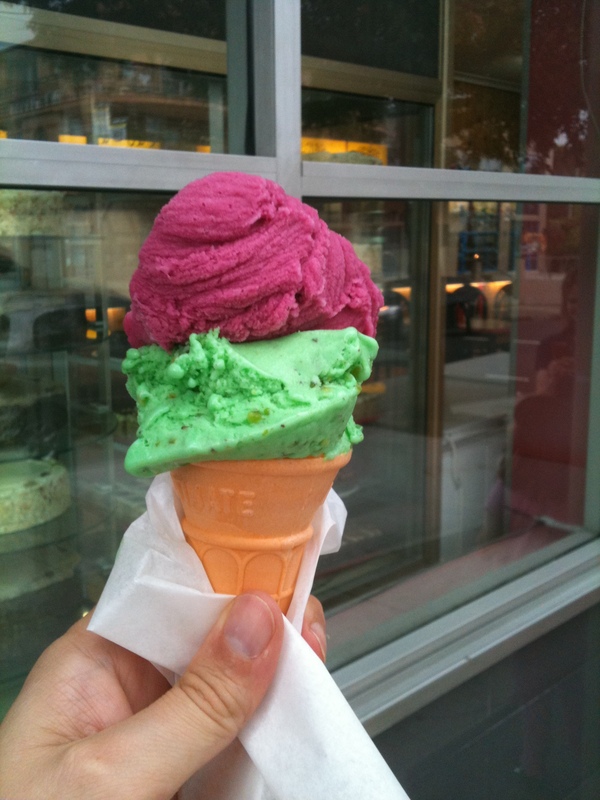 Try the pistachio (with pistachio chunks) and raspberry. Get a look at those wonderful (and natural) colours in the photo. This entry was posted in Arabic, New South Wales, Sydney and tagged Falafel, Food, Jasmins, Kibbeh, Kuftah, Lakemba, Middle Eastern, Sydney. Bookmark the permalink.